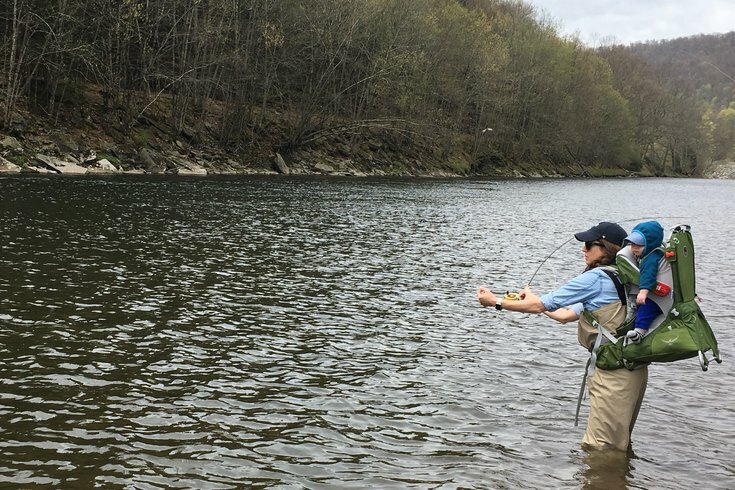 Katie's baby went fly fishing with his mama and daddy in the Catskills last weekend. An Osprey child carrier, proper clothing and sun and bug protection allowed them to safely bring Killian along with them in the river. Ralph Waldo Emerson said, “Live in the sunshine, swim the sea, drink the wild air.” If my family had a credo, this would be it. My husband and I love to be outside. While we were expecting our baby boy, we discussed the importance of continuing to do the things we love in nature. We also knew that instilling a love of the great outdoors would have positive health and developmental benefits for our child. While we have had to make some adjustments in our life because of the addition of our new favorite person, we have also successfully incorporated our love of nature, activity and adventure in Killian’s young life – both for his benefit and our own. At 3 weeks old, we took Killian on his first hike. A local state park near where we live in New Jersey offered an easy trail for us to enjoy the autumn colors. Our son was wrapped up in layers and a hat and secured to my husband’s chest using a Boba Baby Wrap. As we walked through the woods together as a family, we enjoyed the fresh air and beautiful scenery. It was a lovely, special day. Most people we passed cooed over the baby, but a couple of hikers looked at us as if we were crazy. It was the latter group that made me feel a little insecure and ask, “Should we have our newborn on a hike?” Like all things, I spoke with our pediatrician about it. She cautioned that we must always ensure our son is properly dressed and safe but emphasized the benefits of being outside for babies and postpartum mothers. With her endorsement, we started enjoying our favorite outdoor pastimes as a family of three without reservation. The Boba Baby Wrap worked really well for hiking with Killian when he was a newborn, but as he has grown in size, we needed a way to safely carry him on our backs. My husband researched a number of different products before deciding to buy an Osprey child carrier backpack. It is really great! Not only does it have a ton of awesome features like a place for your CamelBak and a pop-up sun/rain visor to protect your child from the elements, but most importantly, it keeps baby boy secure when hiking. We recently visited Dingmans Falls in the Poconos, which I highly recommend. While perched on my husband’s back in the Osprey child carrier, Killian was safe, comfortable and happy. We brought along our camping hammock, which provided a nice place for Killian to lie with his daddy and have a bottle when we stopped for a picnic lunch. When we go fishing with Killian, we also use our Osprey pack. This past weekend we celebrated my husband’s birthday by fly fishing in the Catskills. Roscoe, New York, is called Trout Town USA and for good reason. Killian spent hours on our backs as we caught rainbow and brown trout. He was content and happy in nature without any toys or distractions. He seemed to love every second of being on the river! We stuck with our normal nap and feeding schedule, returning to the cabin we rented as needed. Killian was amazing, and we had an incredible weekend together. We are going fly fishing in Yellowstone National Park this summer and are so excited to bring our baby boy along for the experience! During all outdoor activities, but especially by the water, it is really important to protect baby boy’s skin. That means using a baby-friendly, organic sunscreen and bug spray. We also have a great baby hat and sunglasses that are both practical and adorable. When in the woods, we keep Killian in long sleeves and tuck his socks into long pants to help reduce the risk of bug bites. Our eagle-eyed fly fishing guide, Jeff, snagged a deer tick off Killian before it bit him. Thank you, Jeff! We wanted an all-terrain stroller for a variety of outdoor activities. We also wanted a bike seat or trailer for Killian to ride along with us. My husband found a great all-in-one option from Thule. This stroller is a jogger and has big fat tires that will work well on any surface. With a few simple adjustments, we can hitch it to the back of a bicycle and trail it behind us. Because of Killian’s size and age, we needed to purchase an infant sling insert. We also decided to get the double stroller size since we are planning to have more children. This stroller glides so easily when I push it, and I love the sun visor, mesh screen and rain guard. It was expensive but well worth it considering that we will use it for many years to come. My backyard has an in-ground pool, and I am excited to splash and swim with my baby boy this summer. I purchased swim diapers and a baby float for our aquatic play. Having a pool is not just fun and games, though; we have to take extra precautions to keep our son safe because drowning happens frequently with babies and young children. We are enrolling Killian in infant swim safety classes this month to teach him water survival skills like how to float on his back. These classes will also teach my husband and me how to monitor and care for our son when in and around our pool. We must take every precaution to ensure that our baby boy is safe at all times. I have dreamed of the day when I would play with my baby on the beach. Killian’s MomMom and Zada have started getting baby boy ready for his first summer down the shore by purchasing long-sleeved rash guards with built-in SPF. We are also going to buy a special pop-up tent that will shield him from the strong summer sun and provide a safe place for him to nap. We are planning to build him a little baby pool on the beach by digging a hole, laying a shower curtain liner in it and filling it with water. When the ocean temperature gets a little warmer, I will take him in for his first dip in the sea. Being on the beach and swimming in the ocean are my favorite things to do, and I can’t wait to have my son with me! We have not yet gone camping with our little one, but we would like to this summer. My biggest concern is how to ensure he sleeps safely in our tent. The American Academy of Pediatrics does not recommend bed-sharing with a baby; it increases the risk of sudden infant death syndrome (SIDS). Because of this, I think it is imperative that we have a crib for our son when camping. We have a Graco Pack 'n Play, but it is too big and heavy for hike-in-and-out camping. I have done some research for a better option, but I would love to hear recommendations from parents who have camped with a baby. What do you use? It is fitting that this column is being published on my husband’s birthday. I grew up in the woods and on the beach, loving nature and being outside, but Ryan’s passion for outdoor adventures has provided me with new experiences and hobbies, enhancing my life in innumerable ways. Killian is so lucky to have his father’s love and guidance, both indoors and out. I look forward to watching father and son continue to have fun together in nature, creating lasting memories and special moments that we will all treasure. What is your favorite outdoor activity to share with your children? Any tips for exploring the great outdoors with your baby in tow? Share with me and other parents in the comments section below or tweet me @ThePhillyVoice and @KathleenEGagnon.